00:51 wizzyrea irma is that a wrong channel? 05:56 cait how do i install Sereal in the old Ubuntu LTS? 06:01 huginn dcook: The operation succeeded. 07:16 huginn drojf: The operation succeeded. 07:50 huginn LibraryClaire: The current temperature in London City, United Kingdom is 18.0°C (8:20 AM BST on July 26, 2016). Conditions: Clear. Humidity: 68%. Dew Point: 12.0°C. Pressure: 30.18 in 1022 hPa (Steady). 07:58 huginn eythian: The current temperature in Schiphol, Badhoevedorp, Netherlands is 20.8°C (9:52 AM CEST on July 26, 2016). Conditions: Partly Cloudy. Humidity: 76%. Dew Point: 17.0°C. Pressure: 30.12 in 1020 hPa (Steady). 07:59 eythian ideal bike to work weather today. 07:59 huginn drojf: The current temperature in Berlin Tegel, Germany is 24.0°C (9:50 AM CEST on July 26, 2016). Conditions: Clear. Humidity: 65%. Dew Point: 17.0°C. Pressure: 30.06 in 1018 hPa (Steady). 08:02 eythian drojf: wherever my watch gets its weather info from concludes that a day that has any percentage of rain chance at any point must be a rainy day. So it can be 25 and blue sky, but it still says rain. 09:57 huginn drojf: The current temperature in Berlin, Germany is 25.4°C (11:00 AM CEST on July 26, 2016). Conditions: Mostly Cloudy. Humidity: 66%. Dew Point: 19.0°C. Pressure: 30.09 in 1019 hPa (Steady). 09:59 huginn cait: The current temperature in Bodensee Konstanz City, Konstanz, Germany is 24.7°C (11:58 AM CEST on July 26, 2016). Conditions: Partly Cloudy. Humidity: 21%. Dew Point: 1.0°C. Pressure: 30.12 in 1020 hPa (Steady). 09:59 huginn LibraryClaire: The current temperature in London City, United Kingdom is 20.0°C (10:50 AM BST on July 26, 2016). Conditions: Partly Cloudy. Humidity: 56%. Dew Point: 11.0°C. Pressure: 30.15 in 1021 hPa (Steady). 10:21 huginn eythian: The current temperature in Schiphol, Badhoevedorp, Netherlands is 24.3°C (12:10 PM CEST on July 26, 2016). Conditions: Partly Cloudy. Humidity: 50%. Dew Point: 13.0°C. Pressure: 30.15 in 1021 hPa (Rising). 10:21 eythian according to my watch, it's raining. 10:23 cait maybe with the sip media type setting? 10:25 cait hm could the self check software block it maybe? 10:25 cait what are the sip media types used for? 10:34 LibraryClaire cait, i think you set the media type so you can assign sorting rules on the RFID units? 10:35 cait maybe it can be used to deny checkout/return too? 10:38 cait discharge = return? 12:30 huginn mveron: The current temperature in Grenchen, Switzerland is 28.0°C (2:20 PM CEST on July 26, 2016). Conditions: Partly Cloudy. Humidity: 45%. Dew Point: 15.0°C. Pressure: 30.12 in 1020 hPa (Steady). 12:35 mveron "waiting at LIBRARY since DATE" vs. "waiting at LIBRARY since DATE"
12:35 mveron what is correct? 12:36 LibraryClaire mveron: are those the same? 12:37 huginn Bug http://bugs.koha-community.org[…]_bug.cgi?id=16878 is not accessible. 12:37 mveron Sorry, ...vs "waiting since DATE at LIBRARY"
12:38 marcelr @later tell tcohen "we should still refactor the older code in picture-upload and move it to the Upload module"
12:38 huginn marcelr: The operation succeeded. 12:41 marcelr @later tell tcohen "hm you also refer to upload-cover-image.pl; will have a look"
12:41 huginn marcelr: The operation succeeded. 12:42 mveron LibraryClaire: Thanks a lot. Can you comment on the bug please? 12:49 LibraryClaire victory is mine! 12:57 wahanui Since Thu Jun 16 21:59:33 2016, there have been 256 modifications and 105 questions. I have been awake for 39 days, 14 hours, 58 minutes, 7 seconds this session, and currently reference 48945 factoids. Addressing is in optional mode. 13:11 tcohen cait: can u fill a separate bug for the problems in patron anonymize? 13:11 drojf tcohen: what OS? 13:15 tcohen have you seen bug 16974? 13:17 drojf i don't know. isn't that a thing a sysadmin likes to decide? 13:23 drojf "have you changed anything?" "no. no. no. no. no. no. no. no. no. no. no. no. no. no. ah yes that one thing"
13:27 drojf marcelr: for file uploads, tmp files get a hash based on date/time or something, permanent get one based on… name and file size? 13:30 tcohen have you tried kohadevbox guys? 13:31 tcohen drojf: how is that? 13:31 tcohen drojf: 'what' did not work? 13:34 drojf this kind of problems should be reported to koha probably. because you only have it when deps are added, right? 13:37 wahanui consistency is the hobgoblin of programmers' minds. 13:41 drojf but how far does "install secific lib using" cpan go before it is a "contaminated dev environment"? 13:43 drojf you calling me forgetful? 13:43 drojf what were we talking about? 13:45 drojf but that would still have happened then in that case? 14:04 marcelr a nice game: who's fault it this ? 14:08 drojf eythian: not started. i am still at trockenschwimmen. 14:09 eythian It is now you've leaked it. 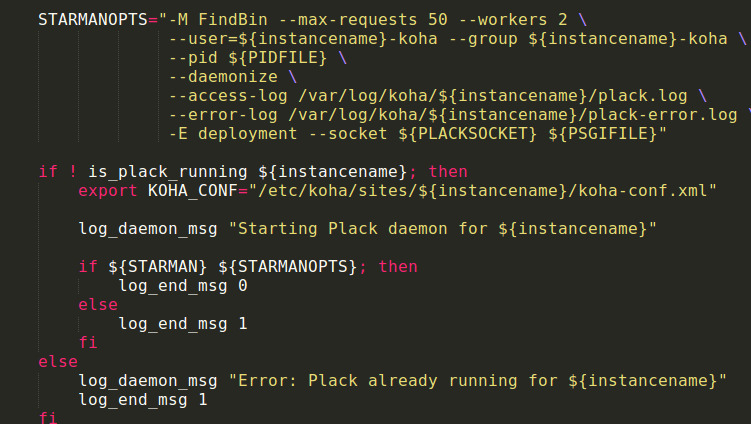 14:11 tcohen eythian: do you have an opinion on koha-* scripts checking for the right permissions and fixing them? 14:13 eythian tcohen: hmm, it should be careful: for example, someone may want a specific ownership (e.g. for backup purposes or something) and messing with that isn't good. I'd probably go for checking and bailing out with a descriptive error message. But I'm not strongly convinced either side, fixing the perms seems not terrible too. 14:18 drojf about koha paths? 14:19 eythian why are the log files owned wrong anyway? 14:21 eythian everything I can see in the policy is about installation, which doesn't really count. 14:53 eythian Can't at the moment, I'm at work. 15:21 huginn drojf: The current temperature in Rue du Capitaine Jean Maridor, Berlin, Germany is 31.0°C (5:20 PM CEST on July 26, 2016). Conditions: Scattered Clouds. Humidity: 40%. Dew Point: 16.0°C. Pressure: 30.06 in 1018 hPa (Steady). 15:21 huginn druthb: The current temperature in Montrose (Mandell Place), Houston, Texas is 27.2°C (10:21 AM CDT on July 26, 2016). Conditions: Mostly Cloudy. Humidity: 91%. Dew Point: 26.0°C. Pressure: 29.91 in 1013 hPa (Rising). 15:31 huginn tcohen: The current temperature in Bo Altos de San Martin - NW, Cordoba city, Cordoba City, Argentina is 13.6°C (12:30 PM ART on July 26, 2016). Conditions: Clear. Humidity: 32%. Dew Point: -3.0°C. Pressure: 30.30 in 1026 hPa (Rising). 15:32 huginn tcohen: Error: No such location could be found. 15:36 druthb 14C sounds *lovely*, tcohen. 15:51 huginn nengard: The current temperature in North Acres, Austin, Texas is 29.4°C (10:40 AM CDT on July 26, 2016). Conditions: Overcast. Humidity: 73%. Dew Point: 24.0°C. Pressure: 29.94 in 1014 hPa (Steady). 16:09 mtompset you mentioned plack. 16:09 mtompset I dont have plack running. 16:09 mtompset And I don't know how to get it running. 16:09 mtompset And it's a low priority for me to get it running. 16:10 mtompset But I did eyeball that, and was wondering why you shifted the caches from one scope to another. 16:10 mtompset sadly, I have to run. Back in... 4+ hours. 16:11 mtompset I make no promises, but maybe, mveron. 16:12 mtompset Have a great day (24 hour period), #koha mveron. 16:12 mveron mtompset: Same to you! 17:19 cait how do i install Sereal? 17:23 cait check if you have an ACQ framework maybe? 17:23 cait and for plugins in your framework? 17:23 cait ... but i'd still like a hint about Sereal installation... anyone? 17:23 drojf cait: cpan Sereal? 17:25 eythian cait: get drojf to package it? 17:29 huginn drojf: The current temperature in Rue du Capitaine Jean Maridor, Berlin, Germany is 29.4°C (7:20 PM CEST on July 26, 2016). Conditions: Clear. Humidity: 42%. Dew Point: 15.0°C. Pressure: 30.09 in 1019 hPa (Rising). 17:33 khall cait: confirmed, I started with a clean db and how it's working! whew! 19:02 huginn mveron: The current temperature in Holderweg, Binningen, Switzerland is 26.3°C (8:53 PM CEST on July 26, 2016). Conditions: Scattered Clouds. Humidity: 56%. Dew Point: 17.0°C. Pressure: 30.09 in 1019 hPa (Steady). 19:07 tcohen wizzyrea: can u please re-sign 14642? It seems that at some point the sysprefs patch got obsoleted and missed your signature. 19:13 eythian @later tell wizzyrea I have a beer from Kansas City here. Pretty nice. 20:13 huginn cait: The operation succeeded. 20:36 cait hm native speakers around? 20:53 eythian I think e-mail is more formal, but everyone normally uses email. 20:55 huginn eythian: The current temperature in Schiphol, Badhoevedorp, Netherlands is 18.8°C (10:52 PM CEST on July 26, 2016). Conditions: Clear. Humidity: 71%. Dew Point: 13.0°C. Pressure: 30.09 in 1019 hPa (Steady). 20:59 huginn rangi: The current temperature in Wellington, New Zealand is 13.0°C (8:30 AM NZST on July 27, 2016). Conditions: Clear. Humidity: 72%. Dew Point: 8.0°C. Pressure: 29.80 in 1009 hPa (Rising). 21:00 eythian Where're they lecturing? 21:28 wizzyrea eythian which beer? 22:00 cait but it still shows no title? 22:09 wizzyrea huh. The default framework maps it to something "bibliotitle.subtitle"
22:34 eythian rangi: Ah cool. A friend has just finished her masters there.